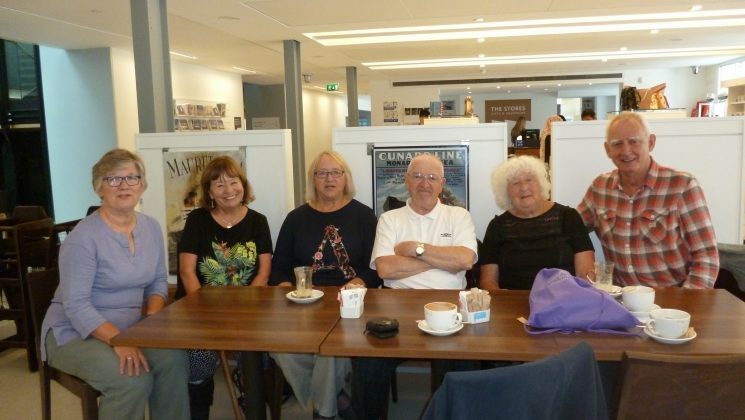 We had a pleasant time at the end of August having coffee, then looking around Southampton Art Gallery, where there was a special exhibition of costumes used in Kathakali, traditional Indian storytelling in mime, with video showing the highly trained actors in action and how they put on the make-up. We were also interested in an exhibition of paintings of castles, (“I capture the castle”) from the expected Old Masters to Gormenghast and Discworld, with Shell posters from the 1930s and various other interpretations as well. Some of us had lunch afterwards, and we all enjoyed ourselves. Our next Open Meeting is on Tuesday October 17th, meeting at 10.30 outside Winchester Museum, the one near the Cathedral. We will have tea/coffee first and then potter around the exhibition. There are plenty of places to have lunch if you want to stay on, as some of us will do. We have been invited to the Discovery Centre in Jewry Street for a tour as well- this is optional. The old library, which was a Corn Exchange before that, looks very smart and modern now. We plan a Christmas lunch on Tuesday December 12th, probably in Winchester, but the actual venue depends on how many people want to come. Please Reply to let me know if you’re interested, and we’ll make suitable arrangements. The menu will include a traditional Christmas lunch and a vegetarian option, but do please say if you have particular dietary requirements. We will, of course, ensure that the venue is accessible. All retired members are welcome to come to Open Meetings, and we will be electing a new committee next March. We urgently need to co-opt a Treasurer! If you have financial know-how and could join our group, we would be delighted. Please let me know.